The Saudi-led coalition in Yemen has welcomed an offer of talks by former President Ali Abdullah Saleh whose forces have been fighting against it. A coalition statement said the decision to "take the lead and to side with their people will free Yemen of... militias loyal to Iran". Mr Saleh said he would be ready to "turn the page" if the coalition lifted a blockade and halted its attacks. But Houthi rebels, his allies until this week, accused him of "treason". The group's leader, Abdul Malik al-Houthi, accused Mr Saleh of being allied with the Saudis, a position he said "was suspicious, but now it is flagrant". "Do not continue. This act is an act of treason. Shame on them. This is shameful," he said. Clashes between Mr Saleh's forces and Houthi fighters have gone on for days in the capital, Sanaa. Aid groups say dozens of people have been killed and hundreds more wounded. The Houthis are backed by Iran but have been Mr Saleh's allies against the internationally-recognised government of President Abdrabbuh Mansour Hadi since 2014. "I call upon the brothers in neighbouring states and the alliance to stop their aggression, lift the siege, open the airports and allow food aid and the saving of the wounded and we will turn a new page by virtue of our neighbourliness," Mr Saleh said in a televised speech. He added: "We will deal with them in a positive way and what happened to Yemen is enough." President Hadi also welcomed the statement, saying he was ready to work with Mr Saleh against the Houthis. He urged the "turning a new page with all the political sides... and to form a broad national coalition that will lay the foundations for a new era and unify everyone against the coup militia". However, the Houthis vehemently objected to Mr Saleh's idea. A spokesman said: "Saleh's speech is a coup against our alliance and partnership... and exposed the deception of those who claim to stand against aggression." On Sunday, Houthi-controlled As-Masirah TV reported that the rebels had fired a missile at the United Arab Emirates (UAE) and hit a nuclear power plant under construction. But the UAE denied the claim, saying its defence and security systems were equipped to deal with such threats. Media captionA Red Cross spokeswoman says fighting between rival factions has left Sanaa on edge. The latest feud erupted on Wednesday when Mr Saleh's supporters accused Houthi rebels of breaking into the city's main mosque complex. There were reports of further fighting in Sanaa on Saturday, with explosions and gunfire concentrated in the southern suburb of Hadda where relatives of Mr Saleh live. The Saudi coalition bombed Houthi positions in Sanaa on Sunday, with the aim of supporting Mr Saleh's forces, Reuters reported. 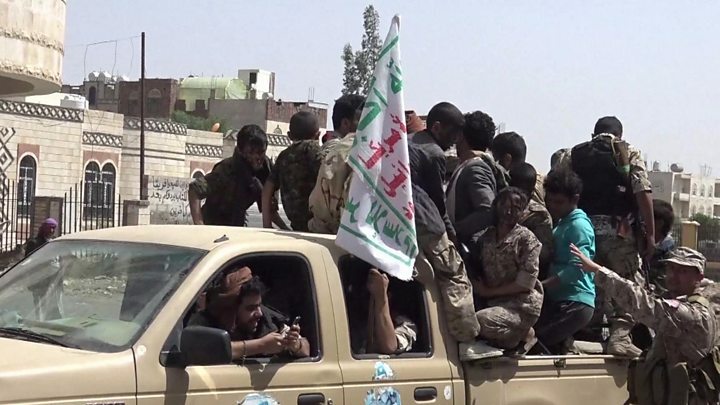 Some reports said Mr Saleh's fighters had seized control of a key Houthi command post. More than 8,670 people have been killed and 49,960 injured since the Saudi-led coalition intervened in the Yemen conflict, according to the UN. The conflict and a blockade by the coalition has also left more than 20 million people in need of humanitarian aid, creating the world's largest food security emergency. It has led to a cholera outbreak that is thought to have killed 2,211 people since April.